Are you building a football stadium at Len Dawson Field? The ultimate goal is to have a stadium at Len Dawson Field; however, our first priority is to ensure the facilities are safe and updated to provide our students with the best possible experience while taking part in our extra and co-curricular programs. The project is split into two phases with the first phase being the most important. Phase One will use district funds to ensure our facilities are up to date. 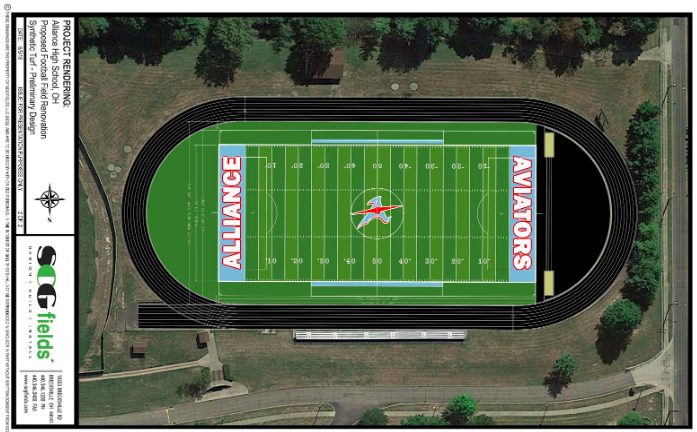 Phase Two will be the completion of a home stadium for the Alliance Aviators, but only if the community interest and financial support exists. What are the two phases? Phase One will use district funds, which have been set aside and allotted for facility updates and maintenance. This phase will provide the district with a synthetic turf football and soccer field along with replacing the existing track. The tennis courts will be moved to new location and a building designated for locker rooms and storage space will be built near the field. Phase Two will use donated funds to create a home stadium and updated fields complete with lights, a band shelter, turf baseball field and softball field (if needed), new home and visiting bleachers and a press box. While this is the goal, this phase will only be completed if the community supports the project and the financial support is available. Are you putting a levy on the ballot to pay for upgrades? No, there is no need for a levy. Phase One will be paid for using district permanent improvement dollars, and Phase Two, if chosen to be done, will require significant fundraising and substantial community support. A levy will not be required to complete either phase. If you use permanent improvement money for this project how will you maintain the school buildings? When the district completed the Ohio Facility Commission project, money was set aside in an account called “Classroom/Facility Maintenance.” This project is what allowed the new buildings to be built and renovations to be made to the existing buildings in the district. The money in this account is designated specifically for maintenance and repairs on the academic buildings in the district. This money will not be used to maintain the facilities ensuring the school buildings will be maintained and in no way will they be neglected. When do you plan to start the project? We hope to break ground on Phase One of the project in the spring of 2019 following the spring sports season. Wouldn’t this money be better used to hire security and teaching staff? The district funds we hope to use for Phase One of the project are designated for facility maintenance and improvements. Our athletic facilities are due for some much-needed repairs. The designated money CANNOT be used to hire new employees or for anything other than facility and building maintenance. Will the facility be open to the public? Of course! We want the entire community to enjoy our facilities as much as our students do! The track and field will be open to the community during daylight hours and when the facility is not being used by our extra and co-curricular programs. Who will benefit from this? This project will benefit our students in many ways! With the completion of Phase One, the facilities will be updated to allow our athletic programs the opportunity to practice on a safe and new track and field. The Students will have a safe place to store their gear in the new locker room and storage facility. Phase One will save time and money with the new turf. We will be able to cut down on cost for cutting the grass and painting the fields each week. School districts similar to ours have estimated a minimum of $12,000 a year by adding a turf field. Should Phase Two be completed, the benefits will be exponential. Not only will we have a home field, we would be able to host tournaments for our athletic teams and potentially for the band, as well. The increase in seating with the new bleachers will provide an enjoyable experience for all the community members who have shown their continuous support over the years and who will wish to keep up their Aviator Pride at the first home stadium. Phase Two will increase the revenue for the district. Having a home stadium will allow the district to charge for games, meets and tournaments adding to the revenue of the district. The funds made will benefit the students and help with the cost of maintenance should the need arrive. Why do we need additional locker rooms? We are currently out of storage space at the high school. Having an outdoor storage and locker room facility for our fall and spring sports will be highly beneficial. The cross country teams and tennis teams currently have to share a locker room and do not have access to a facility to safely store their equipment and belongings. This will remedy that situation and provide the students with the space they need and deserve to have. What will the project cost? Currently, the district is in the process of getting bids for both phases of the project. We will not agree to or move forward with this project unless we feel the cost fits within our desired budget. Has the BOE approved the project? At the Board of Education meeting on January 15, 2019, the board approved the district to acquire bids for the project with a 3-1 vote. This does not allow the district to begin with the project, simply to find out how much it will cost to complete if they choose to pursue both phases.